Vampirella, Mistress of the Dark! 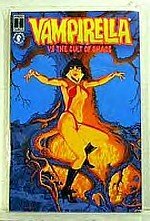 Vampirella VS the Cult of Chaos (1991)/originally $12.95 & 142 pgs., Harris Comics and Dark Horse Comics/sold at on-line and store front comics shops, and at on-line auctions. Actor Jack Nicholson recommend-ed that actors let 'the costume doing the acting' when playing super-villains. Vampirella is all about the costume, and her scanty clothing is all about lust. Nevertheless, under writer Archie Goodwin's pen, her adventures were more about the writer's homage to the myth's created by horror writers H.P. Lovecraft and Bram Stoker. Vampy was an alien from a planet were rivers flowed with blood. On Earth, she controlled her thirst with a serum that, like most of her ongoing cast, was created by Goodwin. Misunderstood and pursued by most as an blood-thirsty vampire, Vampy spent much of her time fighting the Cult of Chaos headed by evil from the stars (Lovecraft) and Dracula (Stoker). It took Goodwin two poorly written and weakly drawn stories to find his artistic footing with Vampirella. Those stories, illustrated by Tom Sutton, kick off this volume. By her third adventure, artist Jose Gonzales had taken a stake (groan) in the series, and Vampy eventually became the second most famous female in comics history. Those stories are also reprinted and, with Goodwin's im-proved writing, saved the series from being junk. Gonzales' beautiful, reality-based art was as important to her success as was Goodwin's writing, and many of her first adventures from the pages of Vampirella (Warren) can be found in Vampirella VS the Cult of Chaos. Although not Goodwin's best work, this collection is recommended for light entertainment. Archie Goodwin will be inducted into the Oklahoma Cartoonists Hall of Fame in 2007. MINIVIEW: Power of 6 [Alternative Comics] If you revel in comics about odd super-teams battling super-natural forces that are drawn as if by a ten-year-old child, prepare to party.